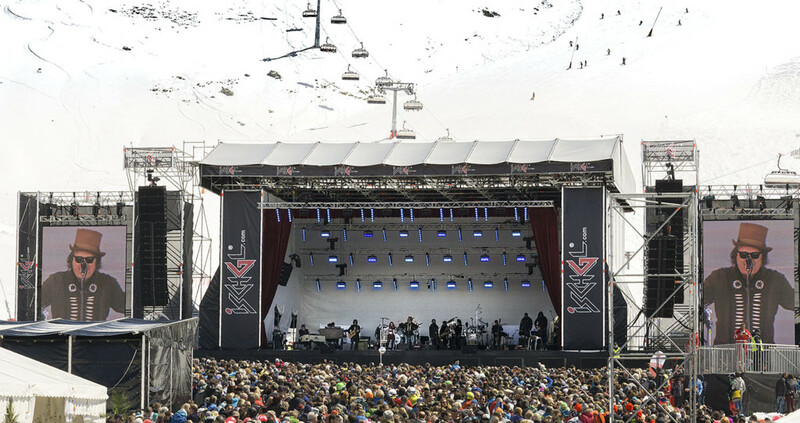 The Tyrolese ski resort Ischgl brought Italian superstar Zucchero (=sugar) for this year’s ski season closing concert. The show occurred on the Idalp, a mountain plateau at 2307m (2522 yds). Year by year about 20,000 people find their way up to this concert arena, which only can be reached by ski lifts. For me, it was one of the relatively rare occasions where I could use my Tele lenses. The event starts about 1 pm and lasts for about 3 hours, where party atmosphere takes place. 🙂 You got a cool Italian Prosecco/Aperol spritz drink.